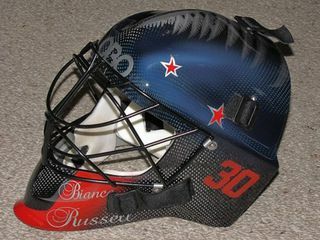 I painted this 2 weeks before the team left for the Olympics.Totally Bianca's requested scheme,"Keep the carbon fibre look, subtle, real looking silver fern etc..Boy did it work?!! Well done Bianca! You are awesome!!! James is a Tokoroa based Sprint Car driver who has won several features in his first 3 or 4 seasons in his Sprint Car. He wanted something really different and had some very definite ideas. I really enjoyed doing this because it was so different. I really enjoy it when people try to feel the chains but they are only airbrushed!!! He was really rapt with the result. I hope it makes him go faster !! 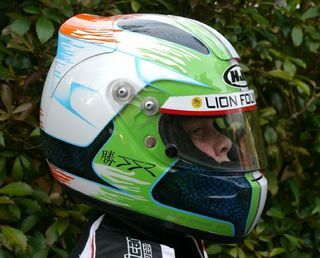 HJC Wet Weather Helmet for Jake!!! Jake liked his first helmet paint job so much that he didn't want to get it wet, LOL, SO... we painted his wet weather helmet with a new scheme. He deserved it, He won nearly every meeting, and took the championship again!!!! Problem is he now has a job deciding which one to wear as he thinks both are "really cool" and he has now stepped up a class! 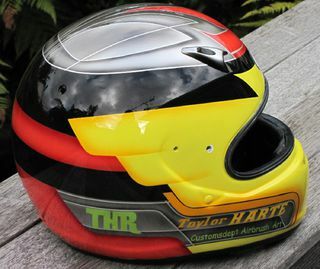 Taylor is a real nice young fella.... he races in the Junior restricted class in NZ Karting, and is considered a future champ in the making!! This was based on a scheme he put together with his favourite colours... Good Luck Taylor... Go Hard Man.. Pics taken after clear finish ( thanks Warren @ Auto Restorations) but before fittings on.. 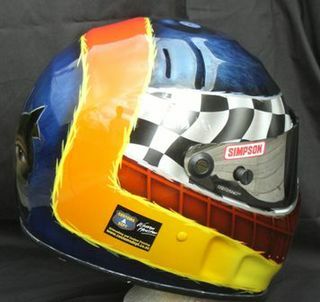 This is this seasons paint scheme on Ethan's helmet. We have "grown" last years theme with rusty panels with 'gas axed" numbers etc, and his favourite cartoon character driving his kart. 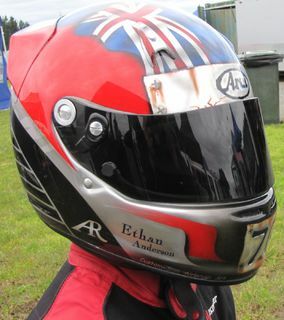 Jacob Smith is an Auckland Karting's uprising Star, and a really pleasant young lad, with a passion for his sport! At age 11, he had just been awarded Most Improved Rookie of the year and Junior Restricted Most Improved Awards amongst many other trophies this season. Here is the result, Go well Dude!!! 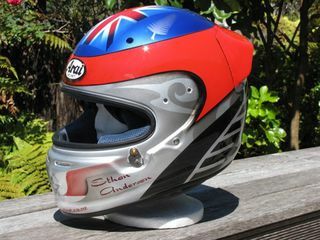 Ethan is a future Champion in the making, and he had strict ideas on how his brand new helmet had to look "very NZ / Kiwi". Great little fellow and I wish him well. Painted in GPI basecoat and 2pac clear. 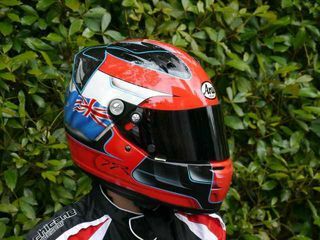 Scott's ambition is to wear the nz1 plate this year, and he wants to do it in style. Thanks Scott, and Good luck!!! 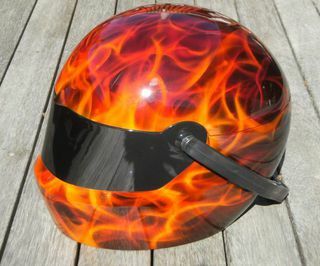 Use our shopping basket to order your personal helmet! 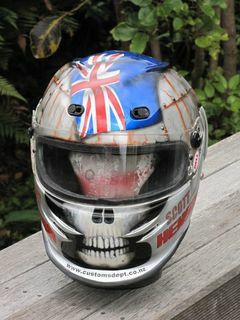 Surprise helmet paint job for "Kook"
He didn't know it but he even asked for the colours!! 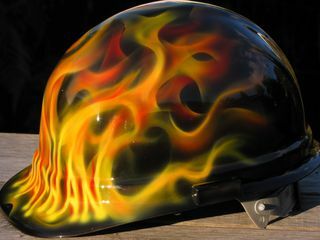 My friend Nathan wanted something done to make his Hard Hat (construction helmet) to look different. So here's what he got!! Garth Is one of these crazy fireman who run up to the top of multi story buildings "just to see if you can do it the quickest"
Seriously these guys are very fit and we are lucky to have them safguarding us!! A 2009 Santa surprise for Mini 7 driver Andy, well from his wife actually!! 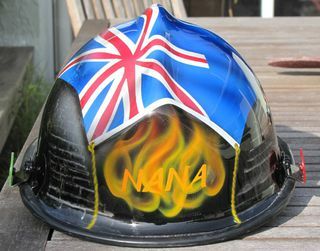 Helmet for Taranaki Chopper Pilot. (Nickname AHA, so airbrushed that in driftwood). 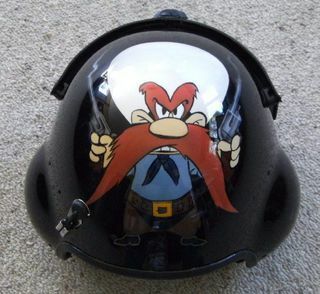 Wanted Ace of Spades and Nickname on visor and Yosemite Sam on the rear. 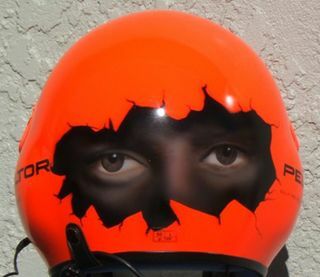 Helmet for un-named driver as car is being built. 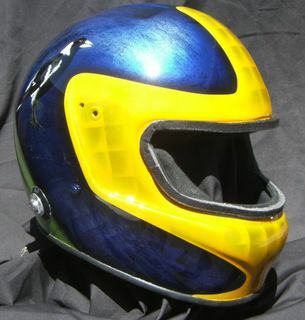 Marbleised Blue and candy, yellow and Gold Candy, basically the race car colours. Magpie is his 'Nickname" and the Grease monkey is his trade. 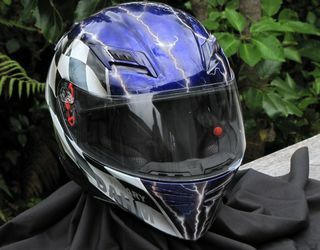 Rear view - Wasn't allowed to mess with the rest of the helmet.